BANGKOK, Dec 28 – Fifty-three political parties have registered to run in the February 2 general elections, according to the Election Commission (EC). 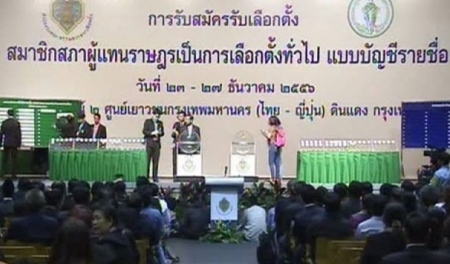 The five-day registration of party-list candidates, held at the Thai-Japanese sport stadium, ended yesterday. Fifteen parties submitted their applications yesterday with three of them turning up just three minutes before closure. Pheu Pandin Party was given the final number – 53. Despite a boycott by Democrat, Thailand’s second largest political party, and widespread protests against the elections, the number of parties contesting in the coming elections is much higher than in 2011 when 40 parties vied in the polls. Registration of constituency candidates nationwide will be held from today to Wednesday.